1:100th scale. Plastic. 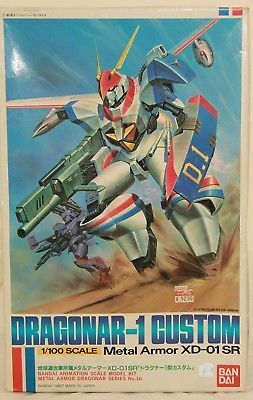 Poseable model kit of the Metal Armor XD-01 SR Dragonar-1 Custom. 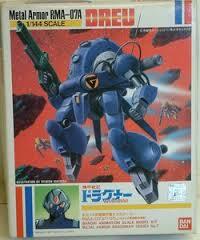 Comes with a pre-assembled, jointed body to which other parts are added. 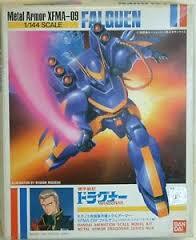 Kit No.16 in the Bandai Dragonar series. 1:144th scale. IP. Metal Armor XFMA-09 Falguen. No.6 in the Metal Armor Dragonar series. 1:144th scale. IP. Metal Armor XD-02SR Dragonar-2 Custom. 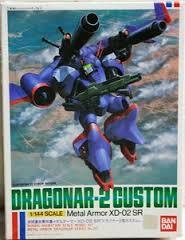 No.20 in the Metal Armor Dragonar series. 1:144th scale. IP. Metal Armor RMA-07A Dreu model. Metal Armor Dragonar Series No.7. 1:144th scale. Plastic. 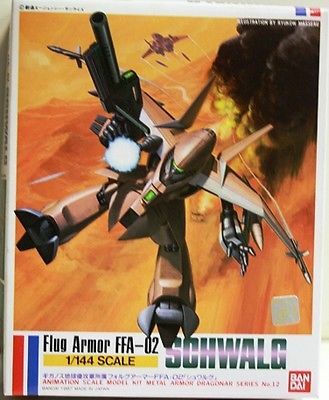 Flug Armor FFA-02 Schwalg. 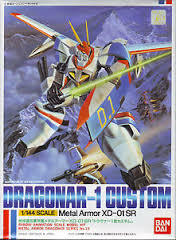 No.12 in the Metal Armor Dragonar series.